Is your backyard still a frozen tundra? Ours is. But guess what? I have neeews...T went back to work yesterday afternoon! It seems like he is recovering well after his minor surgery two weeks ago. The girls and I drove him to work after naptime, and it was like dropping a child off on the first day of school, y'all. I told him to play nice and be sure not to run with scissors. 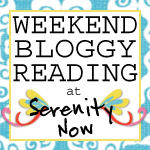 Looking for some good weekend reads? 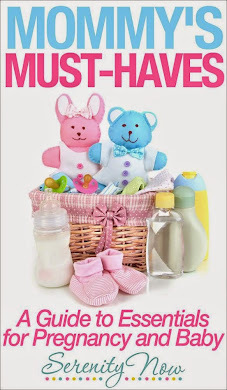 I've got some links from some of the best posts I found in Blogland this week! ~I loved Julia's look back at a few of the homes in her Sleepless in Seattle post. ~Can't wait to bake and devour this recipe forChocolate Chip Cream Cheese Muffins from Southern Fried Dreams. Yum! ~If you visit Beth's Get Your Face On party you'll find all sorts of tips to beautify yourself for your next date night! It should be open for new posts until late tonight. ~If you haven't been reading about Paula's progress on her mom's new-old home, you're missing out! This old home is a real diamond in the rough, and I can't wait to see how it turns out. 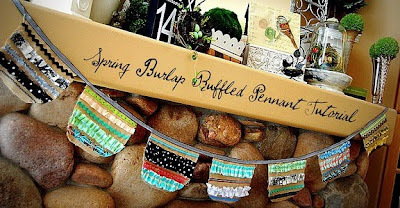 ~In the mood for a fun, fresh, and pretty Spring craft? Try Jen's Burlap Pennant Tutorial. All right, friends, I'm off! We have a coffee playdate this morning (Don't worry, I'm not serving coffee to the kids! I'm going to practice my hopefully improved espresso skills on my friend, Angela). Saturday night is the February Chick Flick Club night. I'll post a recap next week. You may be appalled to hear this, but I used to serve coffee to my kids. When my boys were little, flavored coffees were all the rage. We lived in Michigan at the time, and we drank a lot of coffee. . . and my boys loved it. I always gave them decaf back then, of course--didn't need them to be awake any more than they were naturally! But I'll never forget my two-year-old Preston coming down the stairs saying "Tan I have some detaf hazelnut?" TGIF!!! I'm excited about our church Girl's Game Night tonight! Then I'm painting the rest of the weekend away. Yay! Enjoy yours! Thanks for the shoutout - those cupcakes are delish! My middle child loves coffee! I don't actually serve it to him, but he manages to sneak it out of our cups pretty frequently. He doesn't really care if it's flavored or not either. Yay for Friday! I have a baby shower to go to & spendng so quality time w/ the little sis this weekend. 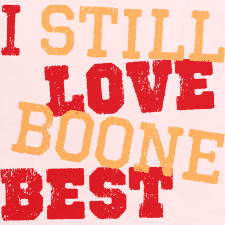 Oh I L-O-V-E the Boone shirt by the way! I had a crying coniption fit when they killed him off, seriously. Lol! Is this new season driving you just as crazy as it is for me? Have a great weekend girl! It's supposed to be sunny here so we are going outside ! My Gram used to give me coffee with lots of milk when I was a kid. It might be just fine, but I'm taking no such chances. My kids aren't getting coffee till they are 21 (and no beer till they're 35?!) I hope Angela enjoys the new barista skills! Sounds like a fun weekend! Mine consists of my Dad coming up to repair our car and dinner with friends. Oh, and a mountain of laundry! haha, I hope T "has a good day at school!" :) I think this weekend holds a lot of relaxing for me, after being sick for 2 days again. boo! Have a great weekend though. My son used to drink coffee--just a tiny bit of coffee diluted with a lot of milk--until he realized that Daddy didn't drink coffee. After that he wanted to be like Daddy, so he stopped drinking coffee like Mommy. Of course, this was years and years ago. DH and I are celebrating our anniversary this weekend. No big plans yet. Have fun at your playdate!! Thanks for putting my banner up - you are so sweet! I WANT one of those shirt! I am getting my hair cut and colored today - I can't wait!!! Hoorah for Fridays!!! Tomorrow I am off on a plane to sunny ( I hope) and warm ( I really hope) Fla. woohoo! LOVING that yellow wreath! Need a little sunshine with all this snow! Well, would you look at how fresh and pretty your blog is? Apparently I'm behind on my visits over here because it all looks new to me. Love it! I have a HOT date with Hubby tonight!!! WOO HOO! That's two weekends in a row! YEA! I've only got 4 hours to get cute - I better get on that really quick! I'm so excited I get to be a girl and have a conversation without interruption, etc. YEA!!!!! Can't wait to see what chick Flick you see! Thank you for the links. I love the wreath; it's beautiful. Sorry you're still smack in the middle of a frozen tundra. I'm sending you warm thoughts. Thank you sooo much for visiting on my SITs day and making me feel like a rock star! So glad to hear he's feeling better and that you made it through without losing your sanity! I'm so glad to hear he's better and working! BTW- I have a friend who happens to be a peds nurse who said that if you suspect your child has ADD you can give them a little coffee (there's actually a proper dosage and you can give it as instant coffee mixed into a smoothie) and if your child does have ADD it will have the same effect as ridalin- focuses them rather than making them hyper. Wild, huh? Enjoy your weekend! Chick Flik night always sounds like fun. Thanks for featuring Mama's house. I hope to get back up there soon to help her again. Chocolate chip cream cheese muffins? ARE YOU KIDDING ME? I am so all over that!